Cut, blend, separate and finish a hair style with this matching set. Let your creativity shine! Get great value with our new "Cotton Candy Lefty" collection. Cut, blend, separate and finish a hair style with this 3-shear and a texture razor set, featuring 5.5 lefty cutting shear, 30-tooth lefty thinner and 16-tooth lefty texture shear. Popular handle design with the slight downward curve in the thumbring fits most hands comfortably. 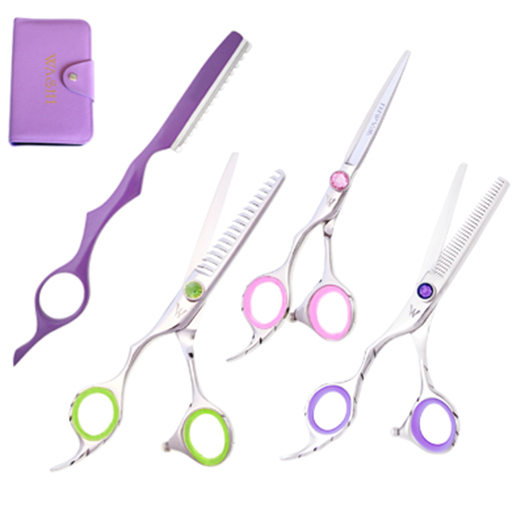 Be versatile and creative with this beautiful hair shear set! Comes is a 5-pc folio case.